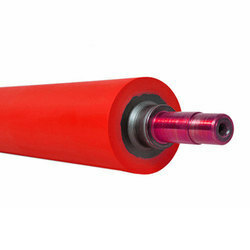 Pioneers in the industry, we offer nitrile rubber roller from India. We are the manufacturer of High-performance Durable Synthetic Nitrile Rubber Roller covering with excellent oil resistance, alkali resistance, water resistance, abrasion resistance and more. Available with meeting International standard as well as customized diameter, sturdiness, dimensional accuracy, application specific structure, high-temperature resistance, thicknesses and lengths as per the specified preferences per client’s requirement. We are leading manufacturer of Synthetic Nitrile Rubber Roller molded in synthetic rubber that offers high molecular structure designed. Also, with premium quality of polymers to use in various industries like steel, paper, textile, printing, plastic and more. All our Synthetic rubber roller with excellent resistance against oil, acid-base, abrasion, corrosion. Also we are manufacturing Ebonite Rubber Roller.